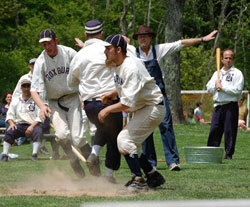 The revival of vintage base ball in Roxbury eventually let to the Harry M. Keator International Base Ball Tournament. For two full days each Labor Day weekend, the northeast’s most talented vintage base ball teams vied for the coveted Keator cup—a prize the home team never relinquished. The tournament gave fans an opportunity to witness decades of base ball history—from the early underhand pitch game of the 1860s to the fast-pitch game of 1898. The tournament did not involve steroids, seven-figure salaries and player used very little equipment—it was just pure sportsmanship and full throttled play by “ballists” who love the game and its rich history. This event was funded by the A. Lindsay and Olive B. O’Connor Foundation, the Eleanor Naylor Dana Charitable Trust and the Preserve America Grant Initiative, a program administered by the National Park Service, Department of the Interior, and Advisory Council on Historic Preservation. This material is based upon work assisted by a grant from the Department of the Interior, National Park Service. Any opinions, findings and conclusions or recommendations expressed in this material are those of the author(s) and do not necessarily reflect the views of the Department of the Interior.